How Do I Renew My Annual Referee Registration? Go to www.refcentre.com and log in to your Ref Centre account. Click where indicated to complete your registration form and submit your registration fees. Complete the online questionnaire (found under the ‘Registration’ tab). Click on ‘Refresher Courses’ (also found under the ‘Registration’ tab) to see the list of available courses in the province and to register for one. You can also see a list of currently confirmed courses before renewing – Upcoming Courses. You must complete these steps to be added to the list of eligible referees for the current year. Please note that additional refresher courses will be added during the course of the season as they are requested by hosting districts and instructors are confirmed, so check back if there is nothing currently that works for you. Outdoor courses run March to June and Indoor Courses run September to November. 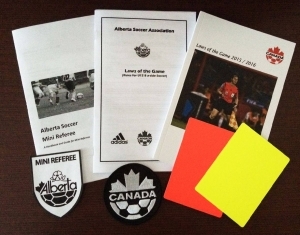 There is no refresher course offered for Mini referees by Alberta Soccer. However, districts and clubs may hold a refresher or pre-season meeting for Mini referees. Please contact your referee assignor for details. If you are planning to take an Entry Level course to become a youth referee in the current year – please do not renew your Mini account, but follow the steps in the ‘Upgrade from Mini to Youth’ tab. Mini Referees who are 14 years or older (on or before May 15th), are eligible to take the two day Entry Level course to become Youth Referees. Register for the course – by doing this, you will create a ‘new’ Refcentre account. Note – you can use the same email address as your Mini account, but will need to choose a different password. You can also see a list of currently confirmed courses before searching – Upcoming Courses. Please do not renew your Mini account if you are registering for an Entry Level Course.